1. 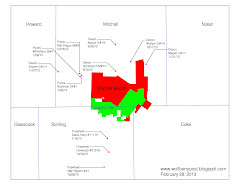 Mitchell Ranch is a big land package that is very rare because it is one contiguous block. 2. If Mitchell Ranch were to be spun out and IPO'd, it could "probably get $250 million for it, worth $2.50/share). 3. Lynden raised its own money and therefore, doesn't get a lot of research from the Street, "It's a bit of an undiscovered gem."